This stone villa is the outcome of an award winning one off design by a local architect. High quality traditional Turkish craftsmanship combines with large airy rooms to provide the best possible living experience. Its size and layout makes it ideal for extended families with plenty of space for everyone. Large terraces and the pool ensure relaxed outdoor living and the shady Turkish seating area is great for barbecues and the odd doze. This is a serene and relaxing spot with the house located on the edge of the village next to the almond orchards with no property overlooking you. Sit by the pool, on the dining terrace or on your bedroom balcony and enjoy the views of the village plain and surrounding mountains. Yet just 10 minutes away is the friendly and bustling town of Kas, giving you the best of both worlds! This is a superb location for spotting local wildlife such as our resident red squirrels, jays, owls and bats, and even a golden eagle. The night sky over the village is stunning, many of our guests particularly enjoy relaxing with a late evening drink enjoying the serenity of the night. The house has been designed around a large central terrace to encourage the flow from the house to living outside, such a feature of summer holidays in Turkey. The front of the kitchen opens up completely onto this space so even when cooking you know you are on holiday. The large family table can be laid in front of you with the fantastic views as a backdrop. Similarly, french windows from the sitting room allow direct access to this area as does the door from the two bedroomed guest house. This upper terrace provides a lovely family space from which you can look down and view the antics in the swimming pool below. The guest house is separated from the main house by a short covered walkway (only a metre step away). This allows added privacy and peace for both sleeping here and in the master bedroom. The guest house has proved ideal for teenagers, for extended families and for grandchildren of all ages. A cot is provided and there is a bath in the ensuite bathroom adjoining the large master bedroom, so little ones are well provided for. The lower pool terrace is well equipped with several wooden sunbeds, cushions, parasols and pool toys. The pool is child friendly with entry steps as opposed to a ladder and the constant depth of 155cm allows both swimmers and non swimmers to enjoys their dip. There are no adjoining properties to the house so the pool is not overlooked. These arrangements, together with the cushioned shaded area below the oak tree, ensure that there is considerable space for everyone to relax and enjoy themselves. En-suite bathroom to master with walk-in shower, separate bath and WC. Shared shower room and WC to bedrooms 2 and 3. Separate toilet / utility room downstairs. Large living room, wood floor and wooden Turkish ceiling: stone fireplace for log fire: 2 soft leather sofas; iPod dock, flat screen TV and DVD (films only), French windows open to terrace. Playing cards, games and jigsaws available. Electric fan. High level cooker, ceramic hob, large fridge with freezer section, dishwasher - all Siemens. Notes on accommodation: The house is looked after by a Turkish couple who live just up the lane. Arzu cleans and washes the linen and towels and Errol looks after the garden and the pool. The house is managed by Tricia and Joe who live locally. Tricia will handle any local problems you may have and provide useful information if needed. Tricia will organise your airport collection and car hire if you wish and we can also do this. The house is quite suitable for children (care with steps) and the spacious interior and walled terraces and garden ideally suit a family or group of 6. We have stayed there with our children + their partners and found plenty of space and quiet spots for everyone. A welcome pack will be organised so that you can enjoy your first evening at the house if you wish. Simply some wine, bread, cheese and salad + basics. Enough however to put your feet up on the terrace wall and enjoy the peace and the velvet night sky! Light the pool, have a late swim and begin your holiday. Outside: The private pool is 40sqm and 155cm in depth with a safe stepped entry area. The surrounding terrace is fully furnished with a range of wooden furniture, parasols and a shower. The upper eating terrace has easy chairs and a table and chairs for 6. At ground level, an ancient oak tree provides day round shade which overlooks a Turkish sitting area and barbecue. This lovely space is 'furnished' with traditional kilims and cushions and is magical when lit up at night. You can enjoy the beautiful views from any part of the house including the wooden balcony outside the master bedroom. The 2 'guest' bedrooms have French windows which open out onto their own private terrace. The house has a surrounding garden which is planted with local plants.There are several stone areas with large turkish pots. We decided not to put a high wire fence round the house which does mean that we can be at the mercy of the local goats on occasion. They can easily be chased off. Utility Room: Washing machine, hot water boiler, additional WC and basin. Hanging racks for washing outside. Washing powder and fabric softener provided. Cleaning / Towels / Linen / Maid service: Bathroom and pool towels are provided, so is linen. Bedding/ towels are changed every week or can be left with guests if they prefer not to be disturbed. The villa is cleaned weekly. The swimming pool is attended to daily, the garden is being developed. Other: The kitchen is stone built inside and out with modern fully equipped kitchen & eating area; air conditioning, French windows to top eating and sitting terrace. Mese Evi was the perfect place to get away from the bustle of every day life. Beautifully situated overlooking the tranquil valley, it was everything we wished for and more. Fully equipped with all that we needed, modern but in keeping with the surroundings. The terraced patio and pool area meant that there was always somewhere to relax, either in the sun or shade. It is near enough to Kas for restaurants and shops but far enough away to be peaceful. On arrival, we were greeted by the house manager and she was very helpful in suggesting places to visit, which all proved to be excellent choices! Nothing was too much trouble and we could not be more grateful. Thank you for a wonderful holiday! We are so pleased that Mese Evi was everything you had hoped for and that you obviously had such a good holiday there. On our site we try to emphasise the peace and quiet of the village with its easy and interesting sample of Turkish rural life. We hope, and our guests tell us, that we have achieved a good combination of relaxation there to go with the fun and friendliness of bustling Kas. Thank you for your super review which just makes us all the more determined to keep improving the house for our welcome guests who appear to enjoy being there as much as we do. Das Haus unter der Eiche (Meşe Evi) hat uns sehr gut gefallen. Es ist großzügig geschnitten und funktionell gestaltet. Die Küche bietet alles, was das (Koch)herz begehrt. Der Blick von den Zimmern und insbesondere von der Terrasse aus in die herrliche Landschaft ist wunderschön. Fast jeden Morgen konnten wir unser Frühstück auf der Terrasse in der Morgensonne genießen. Und nach ausgiebigem Tagesprogramm war es eine Freude, zum Haus zurückzukehren. Den tollen Pool konnten wir temperaturbedingt erst am Ende unseres Aufenthalts (Anfang Mai) genießen. Das Dörfchen Bayındır liegt in einer ausgesprochen schönen Hügellandschaft ca. 5 km von Kaş entfernt. Dort hat man die volle Infrastruktur (Supermärkte, Restaurants, Post, Ärzte) zur Verfügung und freitags gibt es einen großen Markt. Meşe Evi ist der ideale Standort, um die Sehenswürdigkeiten Lykiens zu erkunden. Alle historischen Stätten von Fethiye bis Olympos sind in weniger als zwei Stunden zu erreichen. Ein Mietwagen ist natürlich erforderlich (sehr gute Erfahrungen haben wir mit dem Anbieter „Say“ in Antalya gemacht). Am schönsten für uns war allerdings die Erkundung der weniger bekannten Sehenswürdigkeiten, die überwiegend zwischen Kaş und Demre (Myra) liegen, also in relativ kurzer Zeit erreichbar sind. Hier sind zu nennen die lykischen Stätten Phellos, Kyaneai, Apollonia, Hoyran und Teimiussa. Alle liegen in herrlicher Mittelmeerlandschaft und sind teilweise nur auf versteckten Pfaden zu erreichen. Dafür ist man fast immer allein mit den Felsengräbern, Sarkophagen und den Amphitheatern. Gute Dienste bei diesen Erkundungen leistete das Buch „On the Lykien way“, erschienen auf Englisch bei Uranus und vor Ort im Ticketshop von Xanthos erhältlich. Auch für Strandfans ist gesorgt, der Big Pebble Beach bei Kaş liegt sozusagen vor der Haustür (10 Minuten mit dem Auto) und war in der Vorsaison keinesfalls überlaufen. Ganz viel Platz (einige Kilometer) hat man am Strand von Patara, der in 45 Minuten zu erreichen ist. Meşe Evi ist allen zu empfehlen, die Lykien erkunden wollen und dabei den Komfort eines tollen Hauses nicht missen wollen. Aber auch für einen Erholungsurlaub überwiegend am Pool ist es bestimmt sehr geeignet. Der Kontakt zu den Eigentümern Jane und Tony war sehr nett und unkompliziert, die Verwalter Tricia und Jo waren hilfsbereit und die Kümmerer vor Ort, Erol und Arzu, waren immer erreichbar, auch wenn die Verständigung etwas schwierig war (wir können leider kein Türkisch). We stayed for two weeks from 14 Sept 2014 and had a wonderful time. My wife, myself and our three grown up kids enjoyed the house, its great facilities, and its location on the edge of the rural hamlet. Tasteful, relaxed, beautifully designed - everything one could wish for. Rather than just a holiday let, this place is regularly used by the owners - we felt privileged to stay here. Thanks! Thank you Simon for such a positive review. We are so pleased that you all found the house to be a 'home from home' in Turkey. We hope that we have set it up like that as Mese Evi is our home in Turkey and all our family love being there. It is great to share the house and pool with our visitors who like its location, decor and facilities as much as we do. Just want to thank you for a wonderful stay in your beautiful villa, Mese Evi. It is certainly a lovely house, well equipped and in a fantastic position with beautiful views that we never got tired looking at. The small village of Bayindir, where Mese Evi is situated is a quite rural and very quiet, giving you an added bonus. Nevertheless you are not far from Kas, a delightful town with a great atmosphere (especially at night) and many excellent places to eat and shop. We really enjoyed ourselves, relaxing most of our time on the terrace reading, but also swimming in the pool and spotting wild life. We were lucky to see a European bee-eater, as well as little owl and wild boar. The red squirrels were very entertaining, while the local goats visited us daily! A day’s boat trip around the islands, visiting the sunken city and gorgeous bays for swimming was a highlight. We’ve come back with T towels, towels, chocolate, coffee and biscuits and of course Turkish Delight! If we had more weight allowance on the plane we might also have brought home a rug and some pottery! 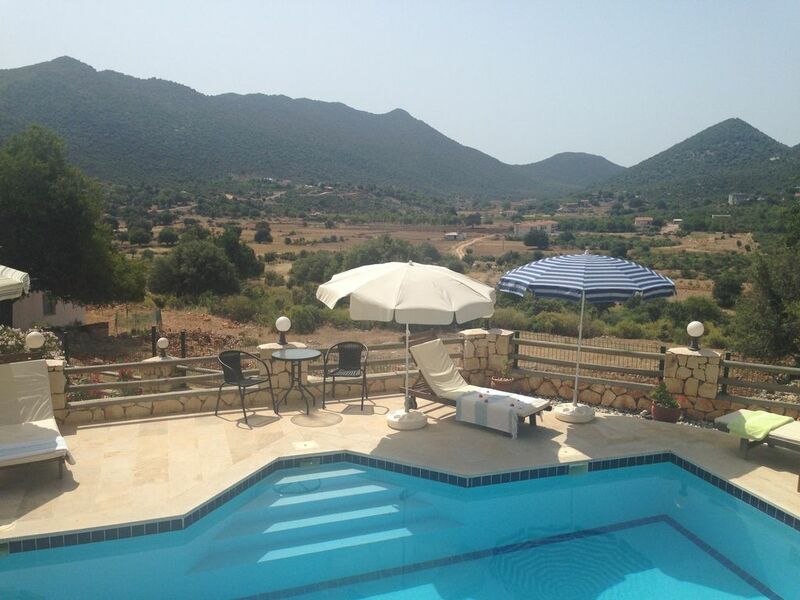 We would definitely recommend the villa to friends and family and I am sure we will be looking to go again soon. Thank you Ian for this very positive review and we are pleased that you both enjoyed your stay so much. You were lucky with the wildlife which we also love watching. We are pleased that you valued the contrast between the peace and quiet of the house and village, and the bustle and friendliness of Kas. Tricia told me how much you had enjoyed the day out on the boat. Your shopping sounds great, I think the Kas shop owners would welcome your return! Our second visit to this wondeful villa, which we were eagerly awaiting. The setting of the villa provides ample opportunity for observing the locals at work & play. Whether it be the goats being moved to fresh pastures or villagers cracking open almonds, there is ample to inspire. Lush greener upon the surrounding mountains contrast starkly with the high summer drought appearance of the valley below. The tranquil location is only a short distance away from the still largely un commercialised town of Kas, well stocked supermarkets provide all basic supplies along side more luxurious goods. The villa provides home from home comforts and it feels like a home, not a rental property. The Pool and terrace areas provide ample space and shaded areas to maximise your time in the the wonderful climate,whatever time of the year. Kas has two distinct faces, the early morning tranquility being broken by local traders setting up for another day alongside the numerous boat owners preparing for another day at sea taking visitors to the many nearby historical sites and local beaches. We are a family with a wide range of ages 60, 40 and 7, we all enjoyed the villa, the location and we all want to return. Mese Evi is a beautiful villa, made from local materials, but with all the modern comforts you need. The house is well-equipped and beautifully presented, with an artistic flair. It is in a beautiful rural setting with fabulous views - very quiet and relaxing. All you see are the goats, the olive trees and the mountains. The pool is a large one, as well as a big terrace for sitting outside in the evenings with a glass of wine and a bowl of olives....A five minute drive takes you to the pretty village of Kas with its picturesque harbour and wonderful cafes and restaurants. There are a wealth of shops selling lampshades, bowls, jewellery etc - it is a bustling, colourful place. Many excursions and boat trips are available and easy to book - the Greek island of Meis is a short ferry ride away and there are lots of little beaches which can only be accessed by boat. All in all, it is a wonderful place to visit, with guaranteed sunshine a lot of the year. mese Evi is a superb property which the owners had built to their own specifications and you would be hard pressed to find a more comfortable or well-situated villa if you like peace and quiet and an open outlook. There are only three houses in the hamlet, so you get the idea! I would thoroughly recommend Mese Evi. It is managed by a local resident, so help is at hand, should you need it or advice as to where to go and what to do when you are not sunning yourself by the pool. I have had two holidays there so far and intend to return very soon. Beaches and beach clubs are a 15 minute drive away in Kas. There are a variety of beach clubs to suit all tastes including the lovely Big Pebble Beach (Buyuk Cakil) which is very close. There is a safe beach suitable for young children with a raft and playground. Good eating facilities can be enjoyed overlooking the sea. Patara beach, the longest sandy beach in Europe, is about 40 minutes away. Kalkan with stunning Kaputas beach is 25 minutes drive and can be reached by local bus as can Patara. Kas is 150km (2.25 hours) from Dalaman International airport and 190km (3 hours) from Antalya International airport. Taxi or car hire can be arranged both for transfer and your holiday by our English manager in Kas if you prefer. We can also do this for you. You will need a car to make the best of your holiday as the bus service from Kas to Bayindir is intermittent at present. Activities in the area include boat trips (gulet cruises), scuba diving, paragliding, sea kayaking and walking on the Lycian Way. For those who enjoy sight seeing, you can explore the beautiful mountain scenery, the ancient villages and numerous archaeological sites. You can find out about many local excursions through agents such as Bouganvillea in Kas. The harbour town of Kas, with its friendly atmosphere and colourful streets, provides a delightful contrast to the peace and quiet of Bayindir. There are many excellent restaurants catering for all tastes and budgets. Easy access to shops, supermarkets and banks helps your holiday and you can enjoy the large weekly Friday market. The Lycian Way footpath passes to the south of the village and can take you along the coast. Kas offers a wide range of scuba diving activities, meeting the demands of both beginners and professional divers. Mountain bikers can use breathtaking off road mountain tracks as well as seldom used asphalt roads. Booking Notes: At the time of booking, a non-refundable deposit of 20% is required. The balance is payable 8 weeks before your holiday start date. Cheques Can be made payable to Jane Mockridge or you can transfer money directly. Changeover Day: Changeover day can be flexible according to guests' needs. Arrival and departure times are negotiable. Notes on prices: The above prices are per week. Changeover days are flexible and dependent on the departure of previous guests. We are happy to discuss rent reductions for 1/2 people staying and for holidays of longer than one week. Email if you wish to discuss a winter let. With its log fire, this is an ideal house for the cooler winter and early spring months. We apologise that our website is currently being updated and will be available soon.